This title was first published in 2002. This book builds on contemporary discussion of 'mysticism' and religious experience by examining the process and content of 'religious knowing' in classical and modern Advaita. Drawing from the work of William Alston and Alvin Plantinga, Thomas Forsthoefel examines key streams of Advaita with special reference to the conditions, contexts, and scope of epistemic merit in religious experience. Forsthoefel uniquely employs specific analytical categories of contemporary Western epistemologies as heuristics to examine the cognitive dimension of religious experience in Indian Vedanta. Showing the developing nuances in the analysis of religious experience in the thought of Shankara and his immediate disciples (Suresvara and Padmapada) as well as in the teaching of Ramana Maharshi, an understudied but important South Indian saint of the 20th century, this book offers a substantial contribution to studies of Indian philosophy as well as to contemporary philosophy of religion. 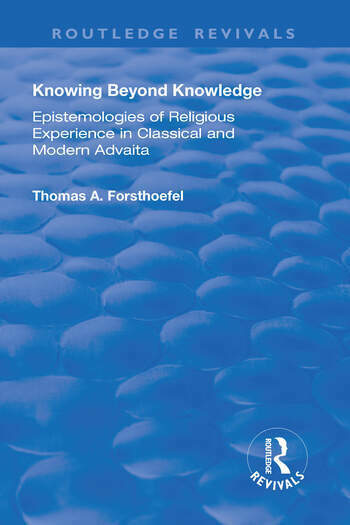 Using the tools of exegesis and comparative philosophy, Forsthoefel argues for a careful justification of claims following religious experience, even if such claims involve, as they do in the Advaita, a paradoxical 'knowing beyond knowledge'. Contents: A brief history of experience: Prolegomena; Religious experience: historical context; Religious experience: contemporary philosophical context; Epistemology of religious experience; Epistemologies of religious experience in classical and modern Vedanta; Epistemology of religious experience in Sankara: Introduction; Internalism and externalism in Sankara; Knowledge and the means of knowledge in Advaita; The culture of liberation in Sankara; Later Advaita on Religious Experience: Suresvara, Padmapada, the Vivekacudamani; Suresvara; Padmapada; Vivekacudamani; The Sage of Pure Experience: the Advaita of Ramana Maharsi: Introduction; Ramana Maharsi: life and works; Philosophy; Revalorizing the culture of liberation; Social and Cognitive implications of the Epistemology of Religious Experience: Cognitive implications; Social implications; How and what we know in Ramanuja's soteriology; Conclusions; Bibliography; Index. Thomas A. Forsthoefel earned his PhD from the University of Chicago, specializing in Indian philosophy and religion. His publications have appeared in numerous journals, including Philosophy East and West, Journal of Vaisnava Studies, Journal of Dharma, and the International Journal of Hindu Studies. His areas of interest include comparative philosophy and theology, the study of mysticism and religious experience, and the phenomenon of the guru in India. He is currently co-editing a book on mahagurus and, in addition, working on a book that examines the epistemology of holiness, The Communion of Saints: Models of Holiness in a World of Conflict (Orbis).